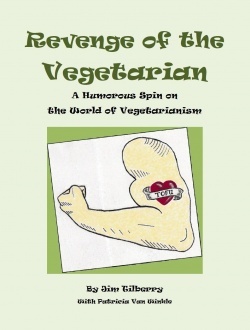 I recently read the book Revenge of the Vegetarian which is supposed to be “A Humorous Spin on the World of Vegetarianism”. I have to admit I was not all that impressed with the book when I received it. The graphics are terrible and it is 70 pages of ignorance in my opinion. You know, I think that I am a reasonably intelligent person. I also think I have a great sense of humor. This book was meant to be comical but I did not find it entertaining in the least. I actually found it very offensive. Maybe that is really what the author was going for? For starters, I am a Christian and very proud to say that I am a Christian. Am I perfect? Absolutely not, no one is but I can assure you that when I lay my head down on my pillow tonight I will be praying for the author of this book. I am not a vegetarian. I have nothing against vegetarians and to be honest with you I was actually kind of excited about reading this book because I honestly thought it would provide me at least a bit of intelligent insight into vegetarianism but to be honest with you, this book is a total joke. Aside from the fact that the entire book sucked and a more intelligent read could have been written by my seven year old, you succeeded in getting your name in print. I actually hate the fact that I had to type a review to give you the 5 seconds of fame that you so clearly desire but I am a woman of my word and follow through with my commitments and I accepted this review through Tomoson and had to complete it.